The Wikipedia information states that Colecovision had the Sound: Texas Instruments SN76489A PSG (chip U20 on circuit board) with 3 tone generators and 1 noise generator. It is not beyond the capabilities of the POKEY. Would have to see if there is a may to multiply to translate to POKEY tones. I had a friend once that could hear the notes. It was amazing. Ok, that sounds a little funny, but what I mean is he listened to Chariots of Fire and we reproduced the song on the TI 99 4a from his memory. Btw I suggest the name be "LASER Clean and Courteous Fun X"
I think the TI-99 used some of the same components as the COLECO. Changing the word "Blast" in the title is only a contingency plan if we get any heat from Activision themselves. For the time being, we will be sticking with its current title. There are some differences between the 8-bit version and the 2600 version. I could not duplicate the sound effects 100%, but I believe what I did actually sounds better using the POKEY chip. Along with all the additional options of having many different enemies on the screen in addition to the tanks. Laser Blast X is now available for $39.95. Edited by peteym5, Mon Nov 28, 2016 10:07 AM. A serious question this time. Since you are writing for cart only, why does the atari need 48K? Isn't all the fun with carts that they even run on 16K machines? With all the bankswitching and all that. I'm not bashing, simply asking a question because I'm interested in everything about atari 8bit. The game actually runs on 16K 400/800 machines and stock 600XL with no RAM expansion. We are looking to port these games over to the 5200. However since the vast majority of Atari have 64K or more these days, we just say 48K or runs on a stock Atari 8-bit machine. The parallax effect really impressed many of people who had seen and played the game, so I decided to use it for another game. I have a military battle game in the works that also uses this effect with a blue sky and clouds background, mountains and trees below. It has planes, choppers, trucks, tanks, soldiers, missiles, buildings, and bombs, all moving on the screen. It has not been given a title yet as the game is still being worked on. 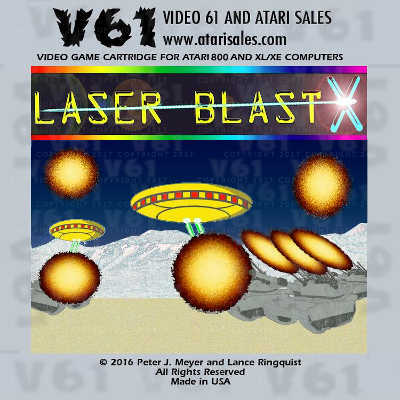 Atari LaserBlastX has many game options that you can choose before the game starts. The recent youtube video, there are many clips of the game with options being played. You can choose to battle just against 3 tanks just like the 2600 game. Battle 4 or 6 tanks on the bottom or add some space planes that can shoot back or take suicide runs at you. The tanks can keep there fixed distances apart or move independently at random. The Tanks can either shoot the laser blasts or energy bolts up at your ship. You can optionally slow move or fast move to each new wave of enemies. So it has many different options. I am putting together some other games that will also contain many different options being capable of playing variants of a video game. Edited by peteym5, Thu Dec 8, 2016 2:57 PM. I was inspired by games like the Arcade Choplifter. I did experiments back in my Turbobasic XL days, but could not get it to look that good. After I recently got better with doing whole programs in Assembly, I decided to give this concept a new take. I had to invent a different type of parallax scrolling for these games that had the ground lines toward the bottom move slightly faster than the lines above them, creating an interesting 3D movement effect. I am really proud of the outcome and I hope it will impress a lot of people. The 3D Ground Scrolling affect will also be done with HeliCommander that is also a 16K game. Replaced the space background with a cloudy sky background, changed the colors to make it look like its on Earth. Edited by peteym5, Tue Mar 21, 2017 10:29 AM. Is it 816 friendly (no illegal opcodes)? It uses standard 6502 code as all my other games do. Edited by peteym5, Wed Mar 22, 2017 10:49 AM. 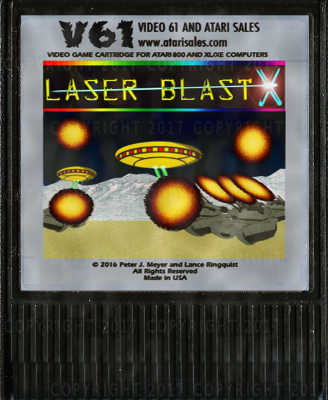 Here is the really cool label I made up for the Laser Blast X cartridge. 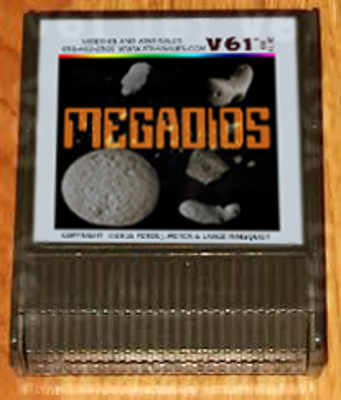 We are doing this retro 1980s silver label look for many of the cartridges. As some of you recall, I did a survey withthe community members to help me choose a label for Secretum Labyrinth, and silver labels got the most picks. We made a some slight changes like having a different logo. These are the actual label for Laser Blast X and Megaoids 2017. 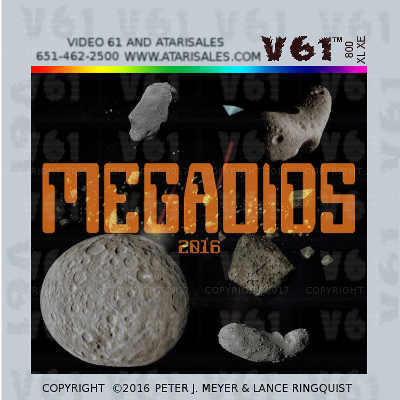 Everyone can see the label for Megaoids 2017 in the prior post. I decided to show them because there was some recent bashing in the Inflate/Deflate thread over some older labels made for other games. I always say what is a good label or bad label is a matter of opinion. Anybody with a printer and can order blank sticker labels can make these things cheap. For those concerned about not using glossy labels, we do not use them because we had complaints about the ink rubs off just by rubbing fingers over them. Edited by peteym5, Fri Apr 28, 2017 6:01 AM. Just because the labels are not up to the artistic/aesthetic quality of many other homebrew releases, I don't think it ultimately matters. People either want the game or they don't. The label should make little difference in a buying decision. For me personally the label is the least important thing, so even if get a cart without a label... I do not care. But if it comes to enjoy your software collection, it is nice when it looks beautiful. I must say I have some pretty boxes of recent games here (like the 25th anniversary box of Tecno Ninja) and the fabulous Dungeon Hunt box. It is not needed, but I can understand why people appreciate a good looking label. I agree that most people will want to play the game itself and being the programmer, that is where I focus. As long as the label looks decent, cartridge hold together, and the game runs, I am satisfied. As stated previously, after seeing what was going on with Venture, I made a decision and proposed a version that fits on a 16K cartridge with inflate and reduce the price after a few months. It is now sold as one of those brown cartridge shells, sold many more after. I tried to look for pricing of doing a batches of boxes and packaging for these games last year. Just been trying to find someone who does not require you pay for a 1000 at a time. Probably won't sell more than a quarter of that. What Video 61 does is a clam shell with some artwork, and a laminated instruction folded sheet. However, I mainly focus on the game and program itself and let Video61 deal with the physical stuff. I did design some of the graphics for the labels. I spend time working on programs, improving routines, and see what else I can make these computers do. You may want to discuss logistics with Jacobus and ask how he handled doing Dungeon Hunt. I think the awesome boxed homebrew games linked in my previous post sold not more than 100 copies at $50 or less (I bought many of them). AtariAge sells a lot of boxed games with a fair price too. So it is definitely possible to sell quality boxed games. Obviously you don't have to make boxed games, if you don't want to. 100 is probably around what I estimated the max number of copies of any game be sold for the Atari 8-bit, despite who makes it, or the price. When you invest in packaging, labeling, and manuals, 100 be a fair estimate on what you need to divide among the cost between all the games you want to sell. I have recently started looking into putting the programs together a little faster. Been starting to look into using Mad Pascal with Assembly instead of 100% assembly. Plus I build these games off from a template. With many of the games with packaging people had pointed out to here, I did notice something. Many of those programmers only produced one game. I would love to see these great programmers to make more than one game, it will keep our market alive. Something we do have to careful about is not to spend too much on labeling, packaging, parts, and ordering a much larger quantity. I understand a few people ordered 500, 1000, or more for their product. If you spent around $900 USD to make a 1000 labels, and only sold 30 units for $25 , you would had lost money. 100 is a fair and good estimate, not just with software, but hardware products as well. I seen many of those "Pre-orders" on products and frequently get less than 50 orders for the initial run. Edited by peteym5, Tue May 2, 2017 8:02 AM.